Sewage pumps repair in NYC is often a serious issue and can lead to a lot of problems and cleanup. But it doesn’t have to be this way. There are ways you can maintain the quality of your sewage pump system and not have to worry about major devastation. In order to help you, we’ve assembled a list of tips to get the most out of your plumbing system overall. But in the event of danger, NY Pump and Motor Repair is still only a phone call away. If you plan on leaving the home for an extending period, you must shut off the water pump or close the main valve before you go. This is a crucial, yet commonly overlooked component of proper sewage and plumbing maintenance. The entire system may fall apart if a leak goes undetected for more than a few days. Please keep this in mind. If you are overly worried about failure to your sewage pump, you can install an alarm in the system. This alarm will create a loud buzzing sound if your pump is near the point of critical failure. This will give you all the time you need to get our sewage pump experts at NY Pump and Motor Repair into your home before you find backup sewage all over your basement. If you have any outdoor faucets, you need to be sure they are able to withstand the varying climates of the different seasons. If they are not able to withstand cold temperatures, then you can always shut them down for the winter and open them again when the weather warms up. If these faucets freeze or become damaged, your entire plumbing system can become a ticking time bomb. Don’t play with disaster when this is such an easy preventative fix. Your plumbing system is delicate. Sewage pumps are prone to fail. Don’t let the failure cause major loss to your home or property. But if you do find yourself if need of a repair, make sure you call our professional staff right away. For more information about sewage pumps repair in NYC, call our sewage pump experts at NY Pump and Motor repair today! Are you in need of cooling pump repair in NYC? Our professional pump technicians at NY Pump and Motor Repair are experienced and ready to help. We are a family run company that has been around since 1941 and we pride ourselves on our family oriented customer care and prompt service. You will find cooling pumps in places like oil refineries, chemical plants, and power stations. Regular maintenance and repairs for cooling pumps is essential. When the evaluation is done, we will discuss all of your options for pump repairs, before opting for a new pump. Once the repairs are done, you can call your technician for regular maintenance, such as: replacing parts, cleaning debris from cooling coils, repairing insulation and so much more. For more information about cooling tower pumps repair in NYC, call NY Pump and Motor Repair at (718) 768-8700. 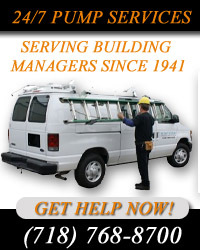 Since 1941, NY Pump and Motor Repair has been assisting businesses with their booster pump repairs in NYC. Our professional pump repair techs are experienced and ready to repair pump problems you may have. We are a family owned company, and treat all of our customers with family oriented customer care. Our prompt and expert booster pump repair service, along with our high level of customer care is something we pride ourselves on. Choosing NY Pump and Motor Repair for your booster pump repairs means you will be assured minimal down time and a properly functioning pump by the time our pump repair service is completed. Our pump technicians can handle any booster pump job, whether it is something small or something on a larger scale, we will be there to help. We understand that you cannot control when something happens to your booster pump, which is why we offer 24 hour emergency booster pump repair in NYC. Whenever there arises an issue with your pump, NY Pump and Motor Repair will be there. Trust our booster pump repair services to get the job done right the first time and for an affordable price. For more information about booster pump repair in NYC, call (718) 768-8700.